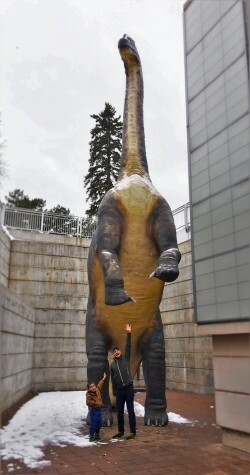 We made the decision to visit Denver, like, beyond the airport Denver. A city that we’d written off at the home of the Broncos (and why would you want to visit there when you live in Seattle) and as just a stop-over on cross country flights, we learned that we actually loved Denver and are already planning our next visit. 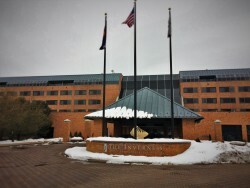 The Inverness Hotel and Conference Center welcomed us for the weekend and we were pleasantly surprised. A lot goes into making a good hotel stay: room size, view, linens, amenities, staff, food… So much to consider. 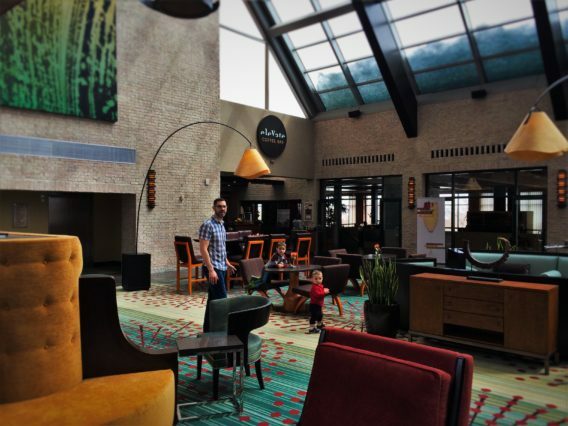 We only had one minor complaint about the Inverness Hotel and most people wouldn’t even notice it, so let’s just say that they nailed it for being an ideal family retreat for us. We got upstairs and it was genuinely beautiful. We actually were looking east across a snow covered landscape dotted with Canada geese and ponds. 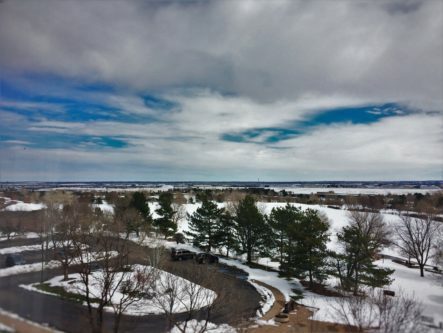 We were perched above a wintery golf course and it was gorgeous. Okay, we’re not in a business park. And the room was nice. Thank goodness. Tip: never hesitate to ask about the view from your room before you get there. It’s easier to move rooms before you’ve unloaded your luggage and it’s courteous to the hotel staff because they won’t have to fix a vacant dirty room. 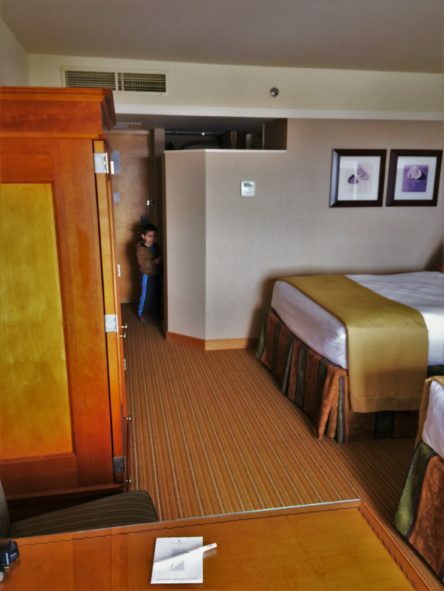 When we checked into the Westin Seattle it took what felt like years to get a crib up to our suite. Not so the case at the Inverness Hotel. Apparently people in Denver are all about being helpful and efficient. It was less than four minutes to have a Pack N Play delivered. When you talk about family travel, speedy delivery of integral items is key. 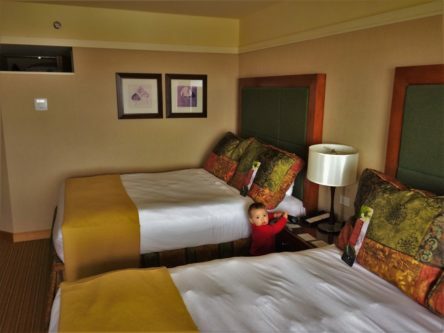 Tip: if you’re using a crib provided by a hotel, ask what the options are. The Inverness Hotel offered either a crib or Pack N Play. We opted for the latter as the crib had a metal frame and we don’t prefer them due to the noise they make when the baby moves or discovers the sound of tapping on metal tubes. The room itself was big enough for a family of four to be comfortable. We had two queen beds, a cushy chair (not a standard hotel room chair), a table with two chairs, armoire, large closet, coffee nook and foyer space. When you’re traveling with little kids, floor space is so important. 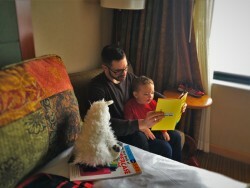 Without in-room play space, you’re set to have cranky kids or frustrated adults who cannot even get dressed in comfort. That wasn’t a problem here. Tip: if you need to rearrange furniture a bit to make a hotel room work for your family, do it! 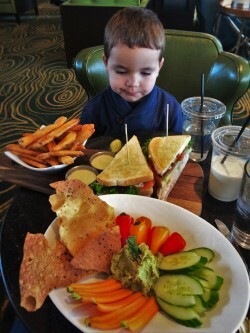 Check out Mastering the Hotel Stay for more ideas on how to be comfortable with kids in a hotel. Never before have we slept to soundly so easily as we did here. Was it because we were so tired from an early flight and then being so active? Was it from taking full advantage of the pool and hot tub? 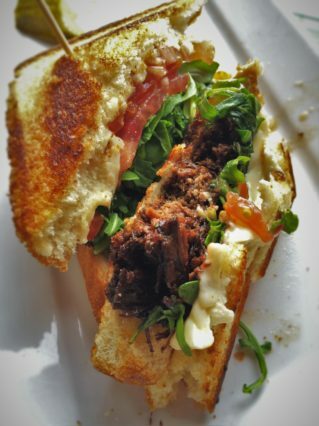 Was it the really good three cheese short rib sandwich? Who knows. The sheets were indeed soft and there wasn’t too many layers of bedding that we were confused getting into bed. The Inverness Hotel’s mattresses were actually more heavenly than any heavenly bed we’ve tried. They are pillow-top mattresses that are also firm. I know, everybody sleeps differently, but these were great and exactly what 2 Tired Dads needed. Ooh, maybe that’ll be our new name?? The only downside to our room what how dry the air was. So, apparently this is actually a Denver thing because we heard other people outside of the Inverness Hotel talking about it. Never fear though: the Inverness Hotel provides cold steam humidifiers. 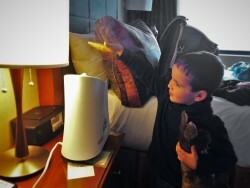 True, this type of humidifier isn’t as effective as a hot steam one, but it made a difference and made us all more comfortable. Tip: if you’re traveling when it’s frigidly cold or in a very dry climate, ask if the hotel has a humidifier. Chance are that it’ll be a cold steam one for safety reasons, but even that will make all the difference. 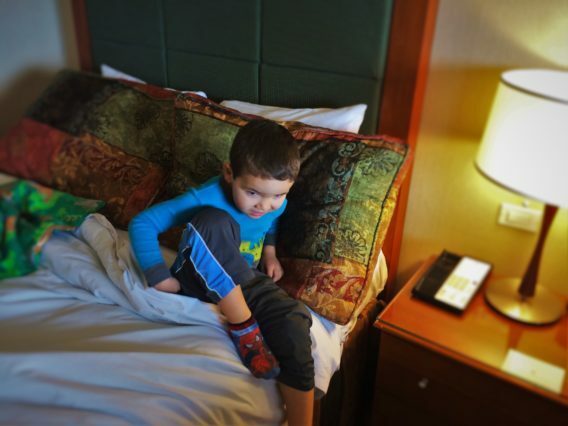 We don’t typically spend too much time at a hotel, but we made sure to enjoy some relaxing time at the Inverness Hotel due to the impromptu blizzard that overtook Denver the day before we got there. We enjoyed some great meals, beverages, swim time and even meeting an international celebrity. We’ll be sharing about this in a separate article, but to give a taste of what we enjoyed… three cheese short rib grilled sandwich, veggie mac ‘n cheese (for kids), pesto hummus, smoked cod, bison, panna cotta… We enjoyed everything we had, especially Easter Brunch. And what did we drink? We were treated to some great local craft beers (which you know we love), some signature cocktails which had local spirits and then, my favorite, the Motherload! The whaaa?? The Motherload is an amazing beer-tail that blends a local brew with spiced tomato juice and vodka. It was incredible. 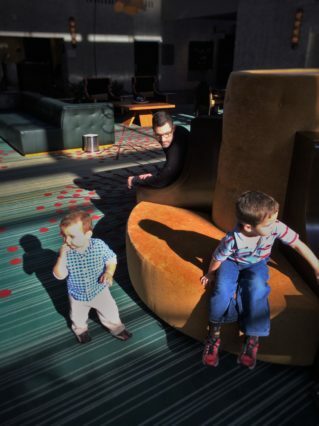 The rest of the hotel was also great for kids. There were sitting areas dispersed through the long hallways of the hotel’s wings, which made for great places to explore. And then there was the grand, huge lobby that had lots of comfy seating and fun things to look at. Oh, and we met a celebrity in the lobby: the Easter Bunny!! Since we were at the Inverness Hotel on Easter Sunday we got to enjoy brunch at the Garden Terrace, had a chance to win spa services via adult Easter eggs, have fun with Savannah the Balloon Twister and get our picture with the Easter Bunny. It was a well done Easter celebration that both guests and locals showed up in droves for. 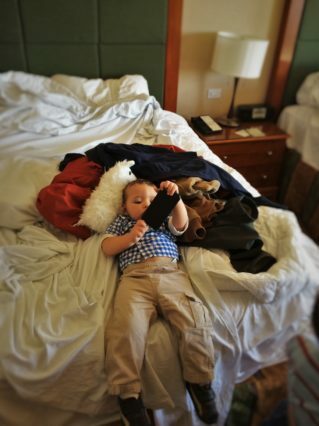 When you’re doing a family travel trip and you’ve got hotel time, it’s nice to not be confined. With snow on the ground and no snow boots in hand, we took advantage of the pool and hot tub. Our first time at the pool it was a bit more chilly than we’d hoped for, as was the spa tub. Visit number two was much better for each. 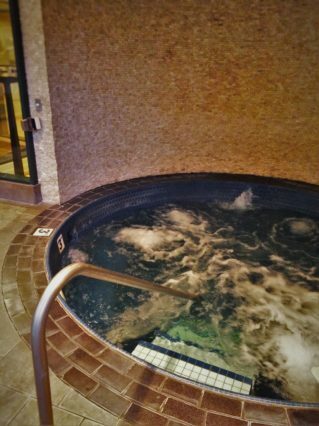 The hot tub was genuinely hot and bubbly… and plenty big. And of course we took advantage of the Inverness Hotel bathrobes. They weren’t our favorite hotel bathrobes as the sleeves were rather short and they were more absorbent than plush, but we appreciated that they were available to us, especially for pool time. 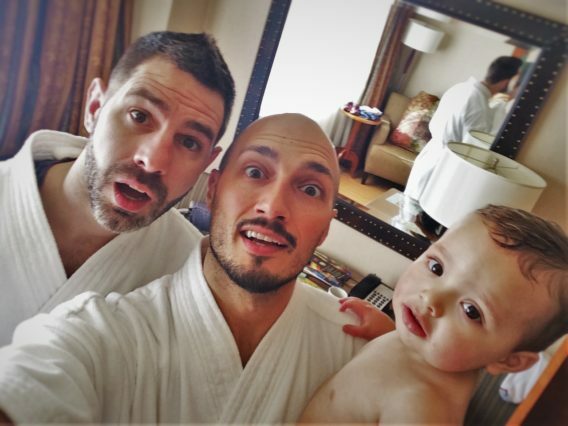 To this day, our favorite hotel bathrobes have been at the Sleeping Lady resort… but those also had warming racks, so it’s not a fair competition. 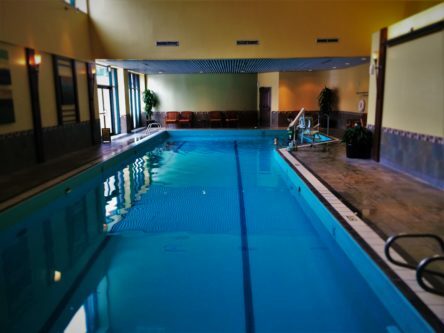 Tip: if you know you’ll be having pool time and have a tiny bit of room in your suitcase, bring a pair of flip flops so you don’t have to wander the hotel barefooted. We were planning on heading up to Rocky Mountain National Park but weren’t able to due to the random blizzard. Next time though, we will be getting a National Park stamp there. We’ll also be visiting the towns of Idaho Springs, Boulder and Georgetown. We can’t wait! We had a great visit to the Inverness Hotel and were happy to be welcomed. Our opinions are our own and we would indeed return upon our next visit to Denver. 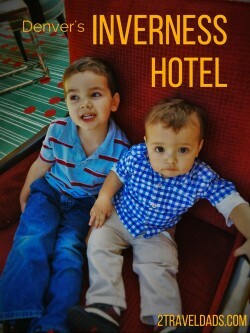 We totally approve of the Inverness Hotel for family travel and it seems perfect for solo/business travel too. If you have any questions about the experience or feedback, leave a comment to let us know. 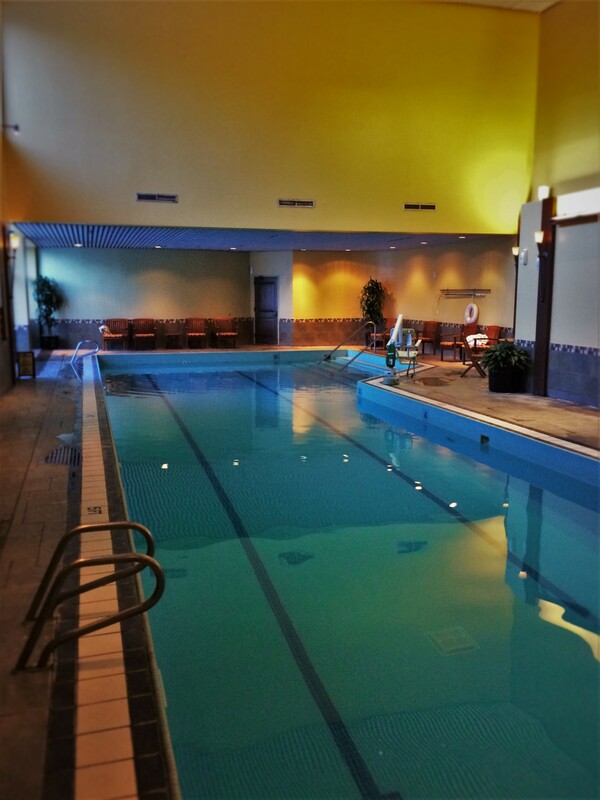 If you’d like to book the Inverness Hotel, visit our link here! Pool, and craft beer? Done. As always your kids are so cute, and using them in your Pinterest images is a good idea! Great review! I have never thought to ask for a humidifier. Brilliant! Do you know if they offer rollaways for a family of 5? I can’t wait to read your food review on this place. 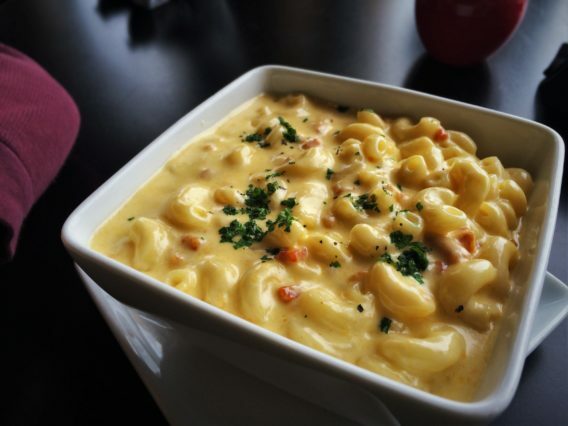 Those food pics are killin’ me! The little fella seems so comfortable in his bed. Sounds like a good place for families. Great read! So creative with what experiences you share with your sons. Looks like a comfortable and spacious property, especially to spend some relaxing time.